Lucy has come a long way from that tomboy who wouldn't give pink the time of day. She's developed into an authentic tween who has learned that girls make great friends, that teamwork means more than stardom, and that God is real. But she's still Lucy. In the third book of the series, she runs headlong into some new---and some old---problems. Although Lucy has come to love and respect Inez and more than tolerate Mora, with school out for the summer, the three of them have more together time than anybody can stand That worsens when the 'monsoon' season keeps them cooped up in the house for three solid days without Dad to referee (he's stranded at the radio station).When Dad is stuck at the radio station without his assistant Luke, the new management finds out just how much Dad depends on his assistant and threaten to fire Lucy's father. Lucy is freaked out at the thought of moving.Plus it gives Aunt Karen more ammunition for her fight to have Lucy come and live with her in El Paso. That would be heinous enough, but Lucy just can't leave now, not with the soccer team making tremendous progress and Coach Auggy scheduling three unofficial games with neighboring teams during the summer to get them ready for the real soccer season in the fall.And not with Januarie getting into 'iffy' territory with the new kids her own age that Lucy and her friends have encouraged her to hang out with so she'll leave them alone. Child Protective Services gets involved when Januarie gets in trouble, and Lucy has to be there for her, especially since this could affect her friend J.J. too.When the weather dries up, wild fires break out with a vengeance. A big one threatens Los Suenos. Myteriously, the only thing destroyed is the soccer field. The big developer who has tried to buy the property before swoops in for the kill. 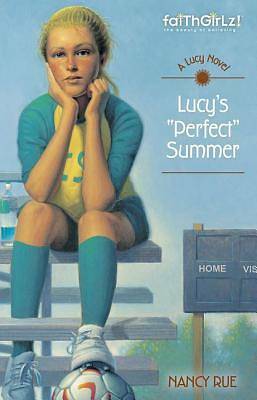 Lucy and her team have to convince the town to come together and restore the field, rather than give up and sell it.Meanwhile, Lucy, Mora, Dusty, Veronica, and Inez study Esther. Lucy grows even closer to God through her Book of Lists and her resonance with Esther, even though she was a girly-girl. That helps her not only save the soccer field, get Januarie out of trouble, and get herself an audition with the Olympic Development Program (without Aunt Karen's help), but it enables her to make a huge sacrifice for Dad and agree to live without him for six weeks while he goes to a special technology school for the blind in Alamogordo. That's going to mean having Aunt Karen come to live with her in the fall. But Lucy is the only one who can do this thing in this time and this place. Like Esther, she is willing to make the sacrifice.